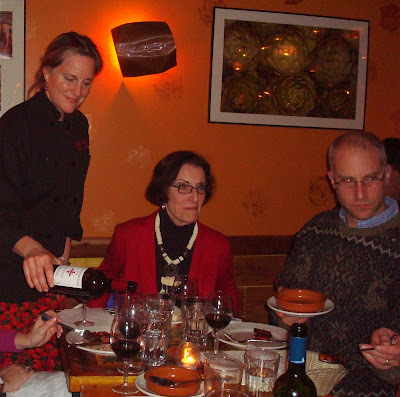 Deborah Hansen explains a wine to her guests at Taberna de Haro. Tasting the wines of Pais Vasco in November with you has been wonderful! In December we will taste wines from Galicia. Galicia is that big, green chunk of Spain just north of Portugal. Shellfish, pork, rain, Gallic lore, and beaches abound. And so do some of Spain's most startling wines! We could spend hours alone just tasting albarino, that beautiful varietal that is subtly tropical and boldly mineral from Rias Baixas, Galicia. I love her miracle - a grape grown in a cool and rainy place on the Atlantic that expresses sunshine through aromas of passion fruit, pineapple, and lychee. However, there is a wide and welcoming array of wines to be tasted from Galicia right now. It's the Sleeping Beauty fairytale for those grown-ups with a predilection for drinking wines grounded in tradition and empowered by technology. It's fair to say that the D.O. 's (Denominaciones de Origen, regulated wine-producing zones) of Ribeiro, Monterrei and Ribeira Sacra, and even Valdeorras to a lesser degree, were a-slumber for decades when it came to producing remarkable wines. Lately an invincible combination of investment, technology, and passion has visited upon the region, and winemakers are now creating wines that reflect traditional styles thanks to modern applictions. They are able to capture the fresh and lively nature of cool-climate wines, and export them to quality-thirsty us! We will taste a wine from each of these D.O. 's, three white and two red, with traditional Gailician dishes as a backdrop to their excellence! The tastings will be held on Wednesday evenings at Taberna de Haro from 6:30 to 8:00 pm, December 2nd, 9th, and 16th. (The tasting is the same all three nights). Respond to this e mail if you would like to attend. The tastings are limited to 8 people each.